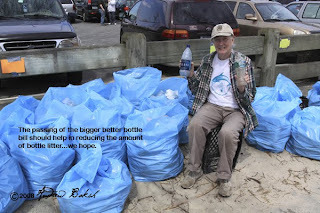 When I got the e-mail from Barbara Toborg, Conservation Coordinator of the Northeast Chapter of the American Littoral Society that we needed to update the website with a bottle bill update, I was elated at the news. Starting October 31st, all containers of water sold in New York under a gallon in size will have a 5-cent refundable deposit. The "Bigger Better Bottle Bill" as it was fondly referred to was a hard fought long battle that saw a stay granted in May, by U.S. District Judge Thomas Griesa to delay implementation of the new amendments until April 1, 2010 as a result of a lawsuit filed by the International Bottled Water Association (IBWA), Nestle Waters North America, and other water bottlers. On August 13th, U.S. District Judge Deborah A. Batts lifted the injunction on all the provisions of the new law that were not specifically challenged in the IBWA lawsuit. This allowed the increased handling fee (from 2 cents per container to 3.5 cents) and the transfer of 80% of the unclaimed deposits to the state to go into effect immediately. On October 23rd, Judge Batts lifted the injunction on the bottled water provisions, effective 11:59 p.m. October 30th. In addition, Judge Batts permanently enjoined one provision of the new law, a New York State-specific UPC labeling requirement, based on constitutionality issues. While the expansion is set to go into effect on October 31st, the New York State Department of Environmental Conservation has announced a "grace period" until November 8, 2009, during which time stores can still sell water bottles that do not have the "New York 5-cents" label without being fined. In addition to expanding the state’s 5-cent deposit on beer and soda containers to include water bottles, the new law also requires beverage companies to transfer 80% of the unclaimed deposits they collect to the state, and make other changes to improve and update the program. These changes went into effect over the summer. Enacted in 1982, the Bottle Bill is New York’s most effective recycling and litter prevention program, with an average return rate of 70%. The expansion to include water bottles brings the law more up-to-date. As a result of expanding to include bottled water, nearly 90% of New York’s beverage containers are now covered under the Bottle Bill. The program still does not cover iced teas, sports drinks, juices, sugared waters, and other non-carbonated beverages that advocates had been pushing for. Source: American Littoral Society NE Chapter. 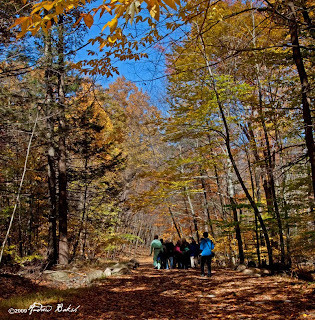 On Sunday October 25th, eighteen participants assembled in front of the NYC Audubon headquarters on 71 West 23rd St and boarded a van and car for a trip to Sterling Forest. 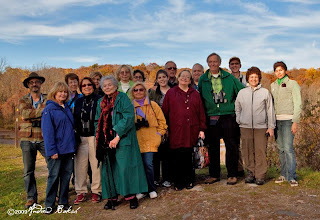 Naturalist, Don Riepe, and I were the drivers and leaders of this group and we would join naturalist John Yrizarry who was going to be our guide for a day hike of Fall Foliage and Raptor Migration at Sterling Forest. 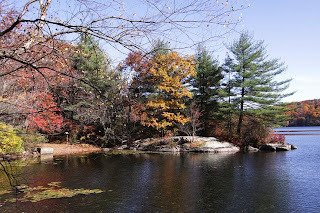 Sterling Forest, located in Tuxedo New York is one of the success stories of environmental conservation and is now a State Park comprising of over 17,953 acres of nearly pristine natural refuge amidst of one of the nation's most densely populated areas. John Yrizarry, 82 and still going strong! Our weather looked good. We had clear skies and the temperature was just about right for a good hike with the expectation that it would be a few degrees cooler at Sterling Forest. We left Manhattan around, 10:15 a.m. and got to Sterling Forest around 11:30 a.m. Along the way, we saw Turkey Vultures, Black Vultures, Blue-Jays, Starlings, Common Grackles, Red-tail Hawks and a possible Golden Eagle. 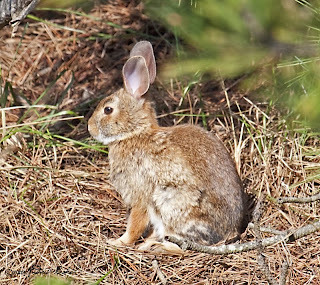 When we arrived at the Frank R. Lautenberg Sterling Forest visitor’s center, John was there to greet us in the parking lot. 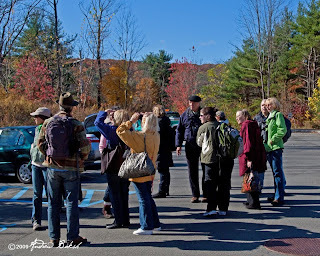 While, Don took the group into the center for an orientation presented by the park rangers present, John and I strategized on what to do. 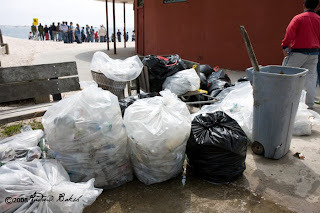 John indicated that there was not much action, an indication that there was not any mass overnight movement of migrants. So, we decided hiking Lake Sterling. Once the orientation was over we set off on the lake trail. John, is a well know naturalist and beloved by many for his jovial manner and vast knowledge. 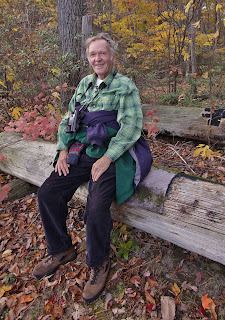 He was in fine form and entertained the group with anecdotes of his experience as a naturalist – the group loved it. Don did the same and took his time to discuss many of the plant species we encountered during our hike. With the sun behind us, we had good light and the foliage was beautiful to behold. The views were breathtaking and all the participants were amazed at the colors. 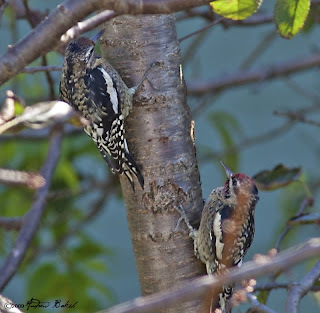 In addition to the gorgeous foliage we got a number of birds including views of a Pileated Woodpecker; a bird we always try for and have heard but had only had one sighting since the annual trip to Sterling Forest began. The first time bird was seen, only two of us got on the bird – John and I. We picked up the Pileated way across the lake flying left over the ridge; John jokingly averaged the distance at a good 20 miles away - it was way out and could not be seen with the naked eye. Try as we might to get the group on the bird it was rather difficult given the distance. 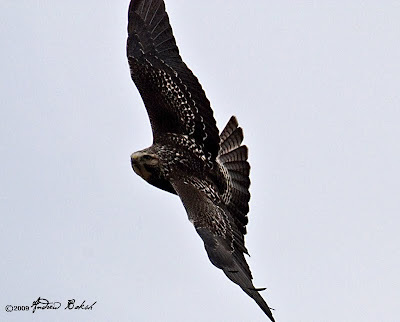 We explained to the group that we were able to ID this bird due to the deep wing flaps and white underwing coverts. The second Pileated sighting of the day, the entire group was able to get on the bird; it flew in while we were having lunch by the lake and came in right over us. The view was spectacular and a treat for everyone - for many it was a life bird. By then, we had hiked well over 4 miles and the group was starting to tire, so we rested a bit then headed back to the visitor’s center. We made one other stop at Eagle Lake where we picked up a few more bird species then headed back to NYC arriving around 7:00 P.M. It was a wonderful day for a hike - everyone loved the trip and looked forward to the spring trip to Sterling Forest when we will go looking for warblers and other spring beauties. 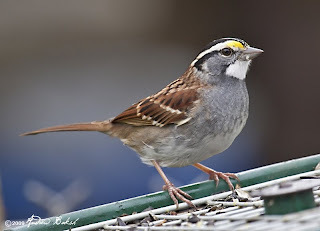 I wanted to get better White-throated Sparrow photos as the one I published in my last post was not an open shot. 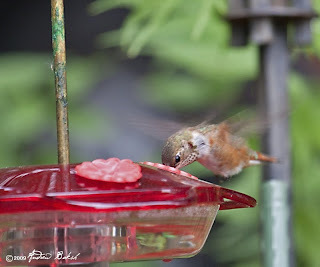 This weekend, I managed a few photos at the feeder. 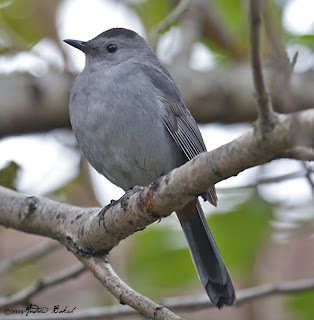 I have also thrown in a photo of a lingering Gray Catbird whose whereabouts will become even more important as we draw nearer to the yearly Christmas Bird Count. Enjoy the photos! I have been asked by some of my readers about my backyard/garden posts. Well, here is one for October. 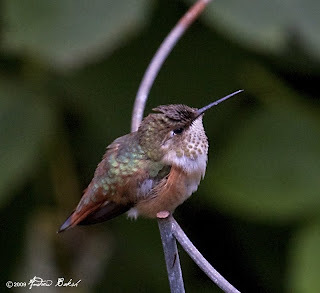 This post covers some of the birds that I have seen and taken photographs of throughout the Month of October in the garden. 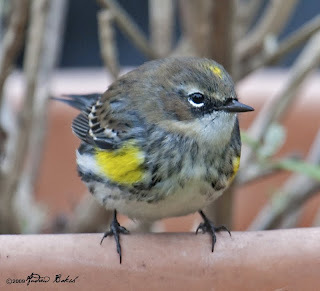 This is usually an exciting time for me as migration has in the past brought interesting visitors to the garden. 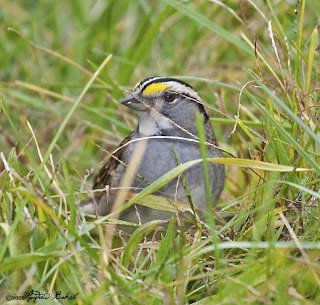 Species like, Pine Siskins, Yellow-breasted Chats, Fox Sparrows have all been seen and photographed - I even had an Eastern Meadow Lark. Keep checking back because you never know what I might find. Enjoy the photos. 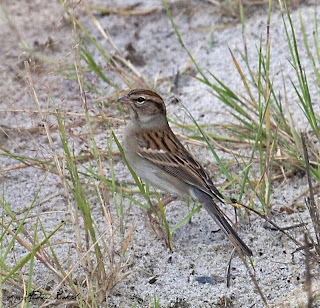 I joined my friends and birders extraordinaire Shai Mitra and Pat Lindsay on Saturday October 11th, for a day of birding at Robert Moses State Park. I was particularly excited because the weather conditions all pointed to a good day for migrants. This feeling was magnified as I hit the Southern State Parkway in foggy conditions around 6:00 a.m. I kept thinking the weather was perfect for an influx of migrants and had visions of birds being everywhere at Robert Moses. As I entered the circle at Robert Moses, I got a call from Shai and we met up at field 2. My excitement quickly subsided, as I did not see much activity along the strip - it looked that very little flight occurred. 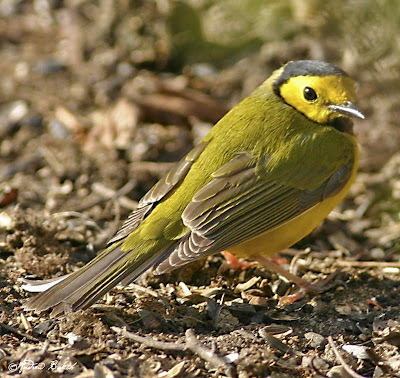 While discussing where we were going to start birding, we received a message that someone had a Connecticut Warbler mere yards from where we were. 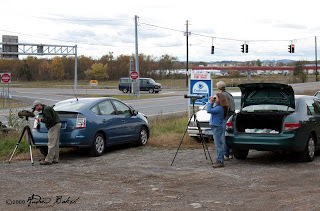 We quickly assembled at the spot and scoured the area for the bird. After some gentle coaxing in the form of phishing the bird showed albeit briefly. Only two people got on that bird, myself and the guy who initially reported spotting the bird. I learned a lesson that day - get good looks at the bird before trying to get others on it. When I saw the bird, I took my eyes off the bird in an effort to get others on it and did not allow myself to linger long enough to really soak that bird in. The bird moved and I could not relocate it, which was a tad vexing. I later applied that lesson. After the Connecticut, Shai and I did a short sea watch while Pat birded another location. The sea watch was not productive, with the only action of interest being three Surf Scoters bobbing in the waves just off shore. 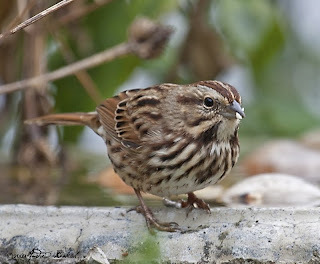 Pat had better luck with Chipping Sparrows, Indigo Buntings, and Field Sparrows at her location. 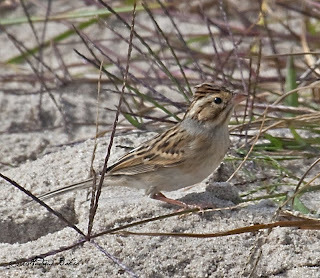 We birded field 2 some more trying to find a Clay-colored Sparrow that was seen earlier in the week. I twice had glimpses, but they were both BVD (Better View Desired). We worked hard at trying to get open looks at the bird, but it remained very secretive. 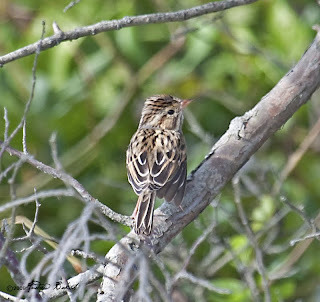 We did get several Indigo Buntings, Chipping Sparrows and Pine Warblers. 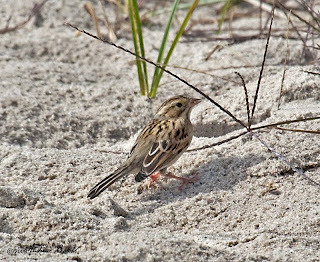 Shai had a fly over Pipit. After a while, we moved onto field 5, where we birded some more. We got a call that the Clay-colored was giving good looks and so we hurried back over since field 5 was not very productive. While there, I was able to key in on the bird and get spectacular looks. 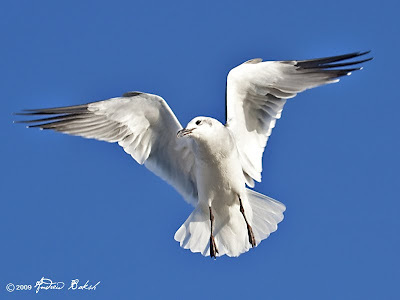 Here I applied the lesson learned earlier as I did not take my eyes of the bird even as folks returning from scrambled looks at 2 flyby Caspian Terns, asked if I had it. After the Clay-colored we birded some more and picked more of the usual species as well as 3 additional flyby Caspian Terns making the tally 5 for the day. By 3:00 P.M. we called it a day at Robert Moses. I continued onto Jamaica Bay where I picked more of the usual species and finally wrapped up my day around 6:30 P.M. 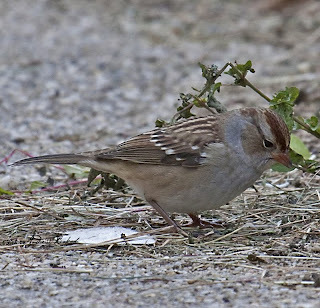 Here are some photos of the Clay-colored Sparrow! On Sunday, while I was out birding at Fire Island NY, I got a text message about a possible Rufous Hummingbird in Staten Island. The name of the person who reported the bird seemed familiar, but I did not make the connection until I picked up a voice message from my friend Howard Fischer on Monday night. 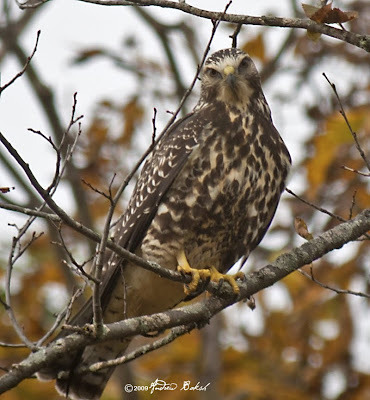 It was Howie that had seen the bird, which was now making consistent appearances in his backyard. I called Howie and spoke to him about the bird. 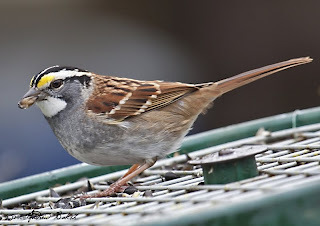 There was no way I was not going to try for the bird – especially since it showed up in a friend’s yard and he even called to remind me of it. 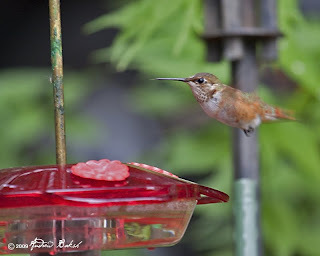 On Wednesday, I finally made it over to Howie and got great looks at "Teddy" the Rufous Hummingbird. The bird was aptly named "Teddy" after Howie’s, Aunt Theodore who was on the phone with Howie when he first glimpsed the bird. 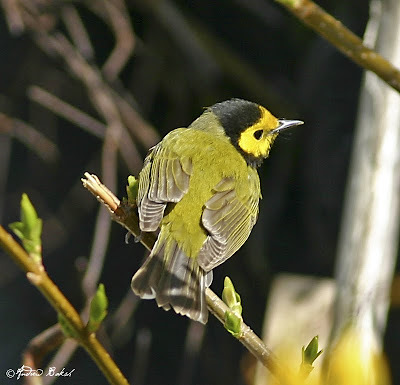 I believe this might be a record first for Staten Island and it could not have happened to a nicer person than Howard Fischer, who is a fantastic birder and has welcomed all who wanted to see the bird. 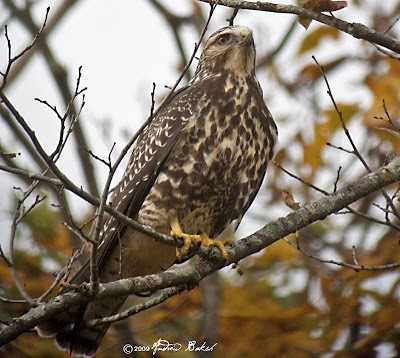 When Christine Guarino posted on the 6th, that Rich Guthrie had seen a Swainson's Hawk near the Thruway Exit 21B in New Baltimore, Greene County NY. 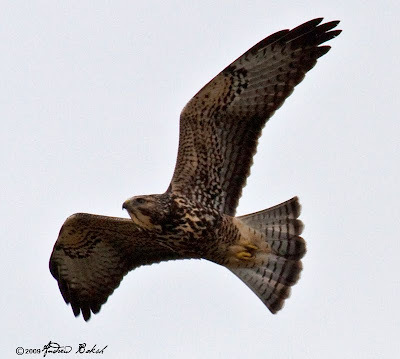 A few days had already passed since the Hawk was found - Rich had apparently seen it two days before. 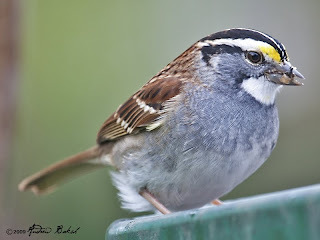 When I read that post, I was thinking how lucky Rich was to have seen the bird, since I expected that bird to move on. However, after a couple of days went by and with reports of the bird still being seen filtered in, I began to toy with the idea of making the run for it. Scheduling was a little tight, so I kept my fingers and toes crossed hoping that it would still be there as the weekend neared. 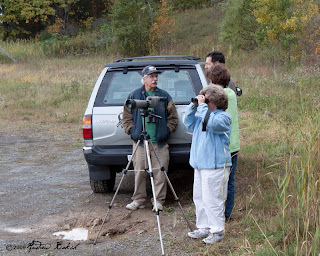 On Friday the 9th, when I spoke to friends Shai and Pat whom by now you should be quite familiar with as I have blogged about some good birding times with them, they gently "gripped" me. Indicating, that they were on their way back from seeing the bird. The conversation with Pat and Shai only strengthened my resolve, I was going to make a run for the bird. By the way, Gripped off - is just one of those birding terminology that means what you are when you've just dipped (missed) a bird that other twitchers (birders/chasers) that arrived earlier managed to see. A few people were suggested by others as maybe having an interest in chasing; however, the connection was never made. Quite content with making the run alone, I was not at all dissuaded and so the gear was packed and the alarm was set. After a sleepless night, which is the norm whenever I have a mission like this at hand. I was up early on Saturday - ready, despite feeling the effects of little to no sleep. By 6:00 A.M. I was on the road listening to the sounds of Metallica, feeling that I left with enough time for sufficient light if I had to wait out the bird. A few hours later, I was pulling through the toll way off Exit 21 B with the sign indicating Coxsackie, getting grins from the collectors as I shouted out to them that I was looking for the infamous Swainson's. Following Shai's advice, I pulled into the lot of Dr. How's Auto Repair and found a spot where I would not impede traffic coming to and from the business. There were a few birders around and a quick assessment of the situation revealed that the bird was not around - at least for the moment. I then, took the time out to walk over to the Auto shop to let them know that I was parked on their property and to thank them for their hospitality. The Auto shop, is owned by Howard and Susan Kusisto (sp) and it was Susan I spoke with. She was very appreciative that I took the time out to thank them. Susan, Howard and other local business owners have been very accommodating and tolerant to the many birders that have descended on the area. 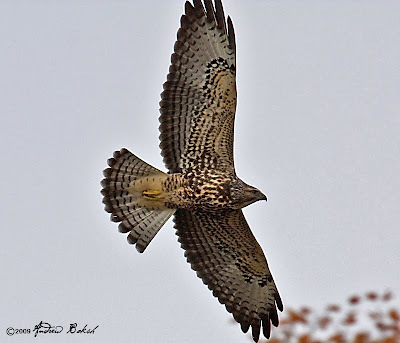 If any of you ever read this post, I thank you all on behalf of my fellow birders...and photographers - can't forget those guys. As I headed back to the truck to get my scope and lens. The Swainson's as is if waiting on cue came right towards me. It was a breath taking sight - what a neat bird! I will stop here and let the photos do the rest, enjoy!